We can all tell when the SNL cast really gets it right—the satire is just the right degree of painfully accurate and comically precise. But their latest skit, “The Day Beyoncé Turned Black,” was one of the best I’ve seen in a while. This weekend, Saturday Night Live celebrated the show’s 40th anniversary with performances from a slew of big name musicians, actors and comedians. However, among all those funny people, there was not one Latina cast member. Saturday Night Live is really running with their jokes about how they’re aware of the criticism that their cast is super white and male. They think it’s hilarious and edgy to joke about that while not actually recruiting women of color to join the cast. Their latest not remotely funny bit of hipster racism came this weekend (after an opening monologue that featured the white guys from Anchorman 2 and the almost all white guys from One Direction. It was really white and dudely) with this White Christmas sketch. Warning: it’s racist. 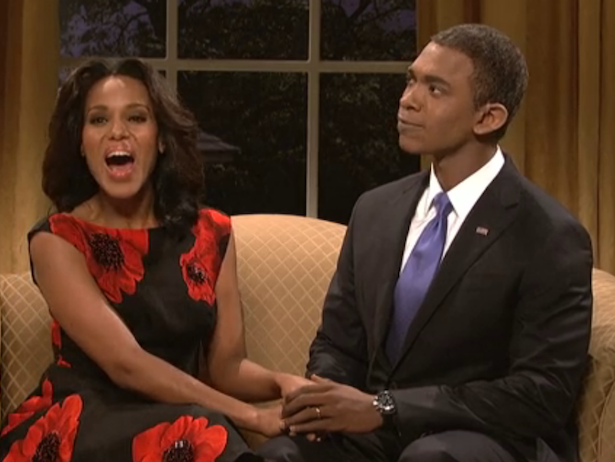 In case you missed it, Kerry Washington’s much anticipated appearance as host of Saturday Night Live this past weekend opened with a direct attempt to address criticism of the franchise’s lackluster effort to diversify its cast. If I’m supposed to feel better, I don’t.